We are 12 weeks and 2 days today! Yesterday was our first appointment. We are seeing Dr. Judd in Provo and he's hilarious. He told me for headaches to take to Excedrin and wash it down with Dr. Pepper.. REALLY???? I about died. Best Dr. EVER!! We also got to hear the heartbeat and it was going strong! Our baby is healthy! S/he's going to be a thumb sucker! Our official due date is April 25, 2009. What a great ultrasound picture! YAY!!!!!! 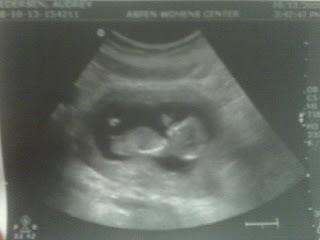 That is a great ultra sound picture! Looks like a girl to me! Beth shared your blog with me so now I can blog stalk you too!!! ;) We're due 2 weeks apart - yea!!! Hope all is well and hope we can get together some time in the near future!